It is true that filing bankruptcy in some instances will allow you to regain your driver’s license. There are a few scenarios where this is definitely the case. The first of which is driving with no insurance. If you are caught driving with no insurance and your license is subsequently suspended, you can have that situation reversed by filing either a chapter 7 or chapter 13 bankruptcy case. The same is true if your license is suspended for failure to pay parking tickets. You could either file a chapter 7 and have your license unsuspended for approximately 4 months and then work out a payment plan with the city or municipality that you owe the money to or you can file a chapter 13 and repay a portion of your parking ticket debt over a three to five-year period with the remaining portion being waived. The other common scenario is if you are driving without insurance and you damage someone else’s property. The filing of the bankruptcy will eliminate the suspension provided it is only property damage which occurred. 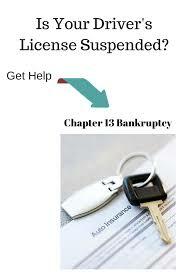 There are cases however were a driver’s license is suspended where bankruptcy will not provide a solution. This happened recently where a current client advised that her license was suspended for no insurance. What she failed to realize or disclose was that her license was suspended for multiple violations of driving with no insurance and her inability to pay the required court fines. In fact, this person technically never had a driver’s license. In addition to that, she was suspended for multiple moving violations with within a one-year timeframe. These types of violations are not the kind that chapter 13 bankruptcy can undo. What the client really needs to do is to hire a traffic lawyer to reopen some of her cases in which the city obtained a judgment. She may be able to work out some type of restitution or payment arrangement with regard to her traffic fines. So just when you think chapter 13 is the cure-all for everything related to license suspensions, you realize that there’s more to it than just that. Granted, filing chapter 7 and chapter 13 bankruptcy will do wonders for most people who have their driver’s licenses suspended. However, keep in mind that not every suspension can be undone by the filing of a bankruptcy case. For this reason, you need to disclose in great detail to your bankruptcy attorney how and why your driver’s license is suspended. It is better to learn up front that your license will not be reinstated then to find out later after you have already filed the bankruptcy case and started making your payments to a trustee. In some cases, it is best to get your license in order first and then file a chapter 13 bankruptcy on your remaining debt. For simple and concise answers to complex issues, feel free to contact my office at 847-520-8100. Nobody does bankruptcy the way that we do bankruptcy.